How can you open your heart of compassion? The best place to start is with you. For if you have compassion for yourself, I mean every part of yourself down to the last molecule, then it is easy to extend it others and to the world. But why is it so very hard to love yourself with profound compassion? Why is it hard to radiate compassion to your flaws, your shortcomings, your vulnerabilities, your wounds and your failures? If you are willing to extend compassion to other people who are vulnerable or show you their flaws, why not extend it to yourself? Many any of you have inner voices of criticism, judgment, self-loathing and disapproval. You may condemn yourself for even the most minor “offenses, as if being vulnerable is an offense! You may judge yourself when you feel ashamed and then fail to offer yourself compassion. This is antithetical to what compassions all about. Compassion is indiscriminate and all encompassing. Compassion is like the great sea, it simply moves everywhere to everything in every moment. 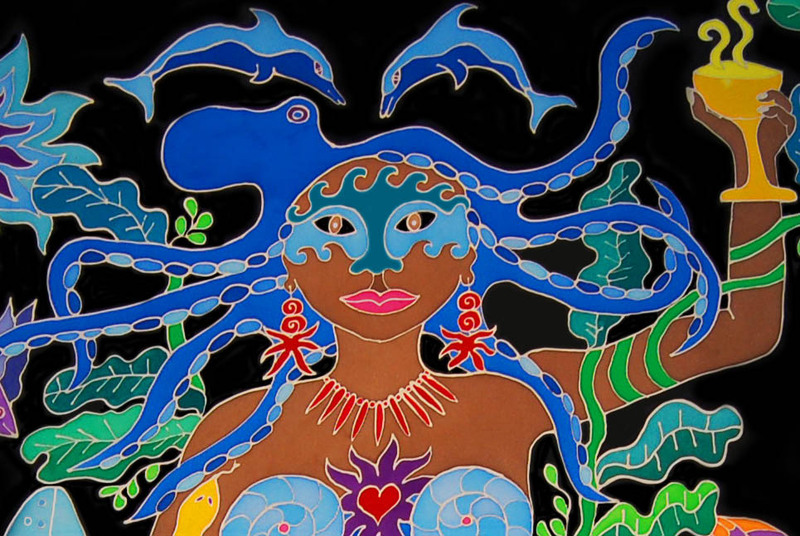 The figure above on Megan’s 16th sacred robe is a Caribbean mermaid, who holds the cup of compassion from which you can drink and extend the deepest compassion to every part of your being. She is compassion itself and she helps you to embody it in every cell.